Just because it’s wet out doesn’t mean you can’t ride, be in control, or miss out on the fun of mountain biking. What you need is a BIKESKILLS clinic! So join the team at BIKESKILLS NW and learn to deal with slippery roots, loose terrain, as well as load up on an array of tips covering foul weather bike and rider set-up even how to make clean up a snap. The clinic takes place at McDonald Park in Redmond WA on February 19th. Start the New Year off right and sign up now! BIKESKILLS NW Grand Opening Clinic 18 September! 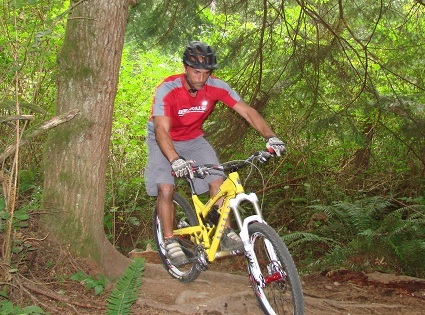 Bikeskills Instructor Aaron Shardelman rips some Seattle area terrain. Bikeskills NW’s Eric Disch, Aaron and their team are getting things going for Bikeskills in the Great Northwest. Join them at Paradise Lake, in Woodinville WA, this coming 18 September. Check out the schedule for more information!